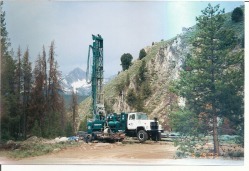 Here at Denning Well Drilling, we are excited about Geothermal heating and cooling. We have drilled many injection wells for customers who are using the earth's stored energy to heat and cool their houses at tremendous savings. We also can do vertical loop systems in places where space is a constraint. Jody installed a geothermal heat pump in his own house and loves it. His son, Jed, also installed a heat pump. They work wonderfully and we would love to talk to you about the cost savings we are realizing right now, and the added incentives that are out there to help pay for the installation. So.... How much could you be saving?